Philly's long-overdue ramen boom has reached neighborhoods across the city. There was a time in the not-too-distant past when Philadelphia locals lamented our lack of noodle shops. Fresh vegan spots? Check. Every iteration of Italian? Absolutely. Cheesesteaks? We’re rolling in cheesesteaks. But bowls of chewy noodles, swimming in salty, rich broth, were sadly in short supply. Over the last few years, though, more excellent ramen has popped up in neighborhoods around the city. From traditional recipes to the surprisingly original, and yes, vegan—here are eight places to find some of Philly’s best ramen. 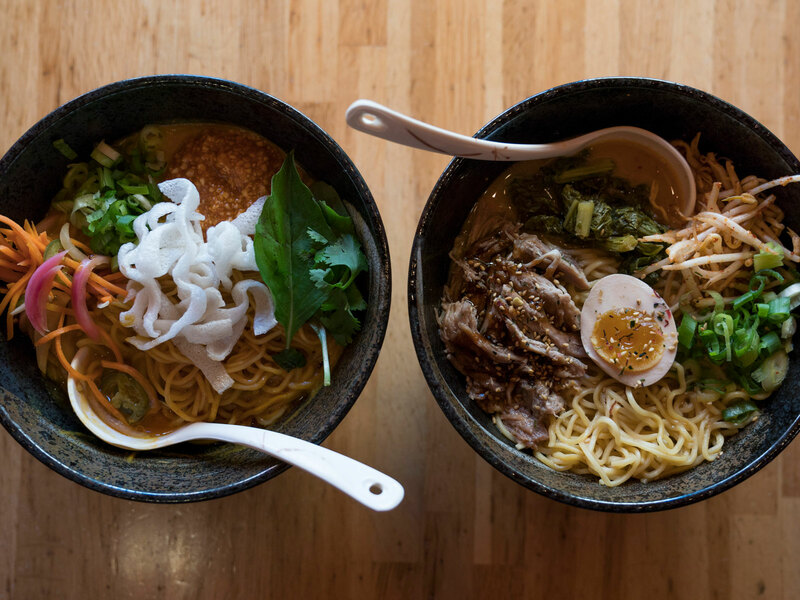 The newest on the scene, Neighborhood Ramen is a food cart-turned-brick and mortar shop by Jesse Pryor and Lindsay Steigerwald. The duo (collectively alums of Zahav, Morimoto, and Cheu) took their R&D seriously—tasting their way through ramen restaurants in the U.S. and Japan—and it shows. Bowls of ramen in classic styles like shoyu and tonkotsu, as well as a vegan version made with mushrooms, all start with made-from-scratch broth. Dine-in only, surrounded by a striking, black and white mural by local artist Kyle Confehr decking the walls. 617 S 3rd Street, Queen Village. 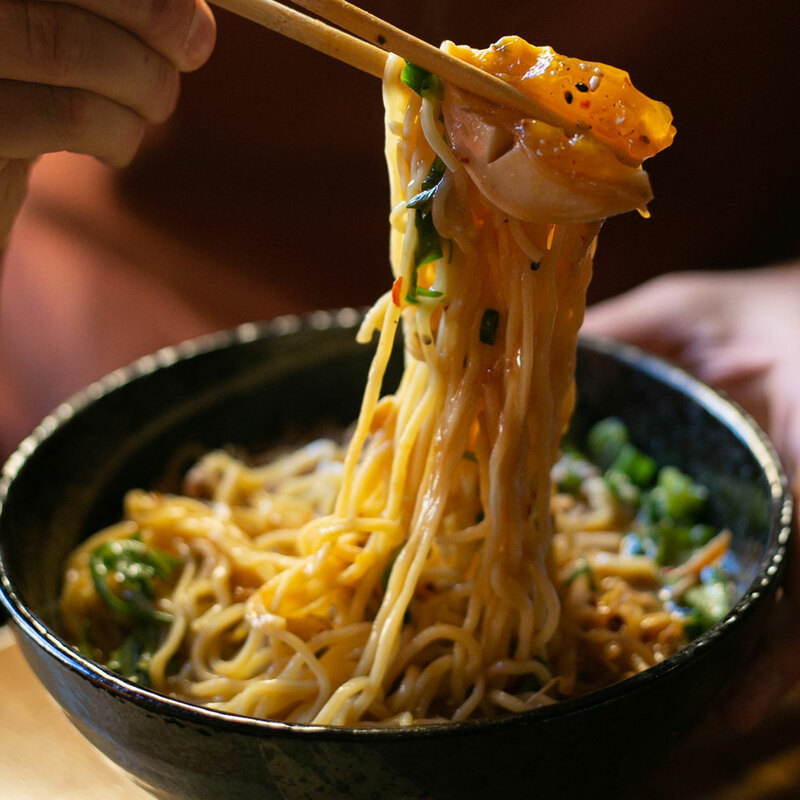 From Shawn Darragh and Ben Puchowitz, the team behind East Passyunk’s Bing Bing Dim Sum and Nunu, the new izakaya in Fishtown, Cheu Noodle Bar isn’t a regular ramen shop. It’s a cool ramen shop. Traditional wood paneling melds with colorful comic-plastered walls—the first clue that while they’re making seriously good food, they’re not taking themselves too seriously. The straightforward miso ramen is rich and delicious, but don’t miss the brisket ramen, with tender ribbons of beef, kimchi, and a fat matzo ball swimming in sesame red chili broth. 255 S 10th Street, Washington Square West, and 1416 Frankford Avenue, Fishtown. After quietly opening late last year, this tiny shop under entrance to the Girard Station El, helmed by a friendly husband-and-wife team, is making a name for itself as one of the city’s best sushi destinations. But the steamy bowls of ramen are also worth a stop. The straightforward menu offers three options, including the chashu ramen with braised pork belly, and the vegetable, with seasonal ingredients like tender bok choy and thin slabs of charred corn sliced off the cob. 1204 N Front Street, Fishtown. The upcoming new menu is on the walls! Get ready!!! This cozy, wood-paneled restaurant in Washington Square West uses sustainably-sourced meat and local vegetables. Try the Black Pig, made with berkshire pork and a flavor boost from bonito broth and burnt garlic oil. Spice lovers should go for the Gates of Hell. As the casual name suggests—the kick it delivers from chili broth, chili oil, and togarashi (a Japanese spice blend) will stay with you long after your last spoonful. 1102 Chestnut Street, Washington Square West. This Chinatown-based shop just opened another outpost in University City last year, and both locations are making traditional ramen styles, including shoyu and miso, but the signature ramen—made with pork bone broth (simmered for two days) and topped with roast pork, kikurage mushrooms, a seasoned egg, and handmade noodles—is a standout. The menu has a handful of other Japanese staples, including donburi, gyoza, and pork buns. 204 North 9th Street, Chinatown. Stephen Starr’s contemporary Japanese restaurant might be the swankiest spot to slurp noodles in the city. Try the yasai ramen, made with vegetarian broth and Japanese vegetables, or the Morimoto Ramen—the Iron Chef’s chicken noodle soup will cure what ails you. 723 Chestnut Street, Washington Square West. Japanese comics and ephemera and, inexplicably, an Iron Man costume behind a glass case, give this cheerful ramen and tea house in Chinatown a playful vibe. But rich bowls of chicken, pork, or veggie ramen are approached thoughtfully, with customizable varieties that include broth options, noodle firmness, and myriad toppings (try the Fire Bomb—a housemade blend of spicy paste.) 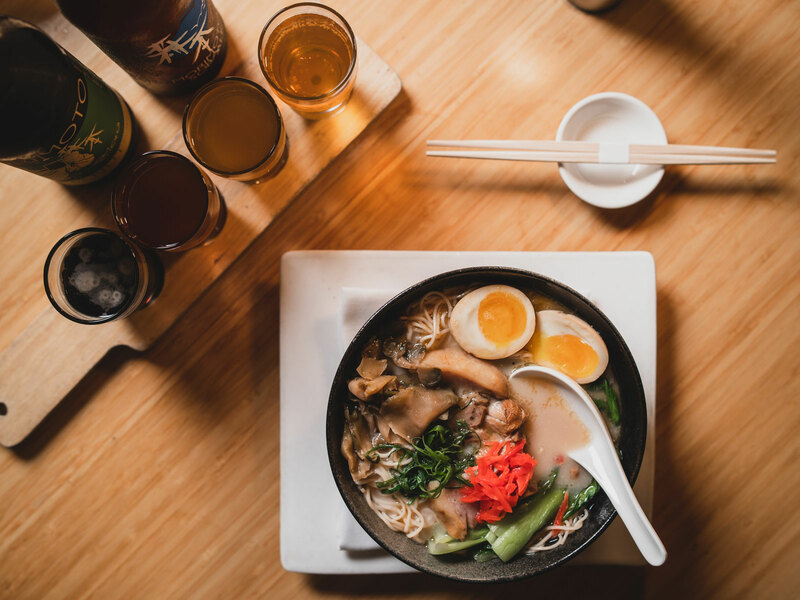 Pair a bowl of classic ramen with a bubble tea, Japanese beer, or sake from their extensive list, and finish with a shave ice topped with adzuki bean and mochi. Bills come delivered in dog-eared copies of a Japanese comic book. 1028 Arch Street, Chinatown. Short for Tomodachi—the Japanese word for friends—the name is a nod to the lifelong friendship between chefs Andy and Steven, a sushi and ramen chef, respectively. The snug BYOB in Old City serves several varieties of traditional ramen, and can make vegan bowls, too. 228 Arch Street, Old City.